I extended a bit on all side played with the colors and added a vector of a page of Trap. It's not complete since it's being draw by Saiko. The title is a (bad ?) pun on the verb draw. It take me long time to vector it entirely but I am pleased with the result ^^ I hope you like it even if it's not the same kind of the previous one. 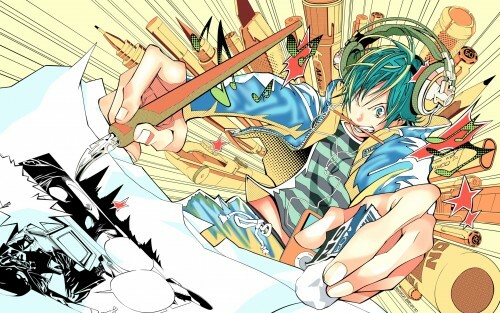 Browse Bakuman Gallery: Recent | Popular. wow great details of colours! colourful! Awesome job! An extra "thanks" for including the how-to. Keep up the great work! I must necessarily begin to read this manga. That is insanely amazing and you did more than a terrific job duplicating it. Good job! The amount of extra detail you put as well as your clean vector makes this wallpaper perfect. nice colors and great image.